When I heard about and saw snippets of this “WestJet Christmas Miracle” video on the news, I found yet another reason to love this low-cost Canadian carrier. The WestJet marketing campaign is absolutely one of the smartest, most heart-warming holiday social media promotions I’ve come across. It already has more than 6 million views on YouTube. 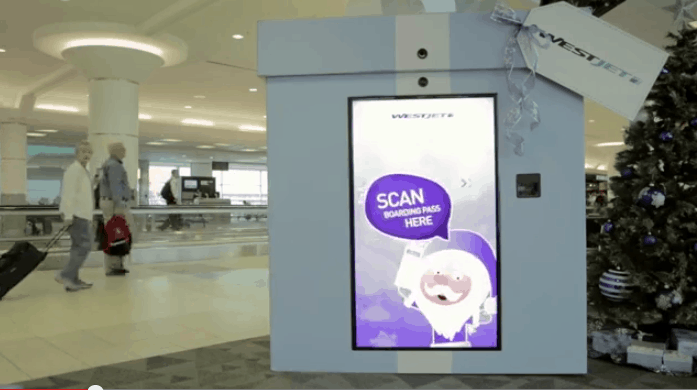 The airline has a “video Santa” ask boarding passengers at Toronto’s Pearson airport what they want for Christmas. When the passengers arrive at their destination at Hamilton International Airport and wait for their baggage at carousel #8, they are amazed to learn that while they were flying, WestJet had some Santa’s Helpers purchase the gifts they asked for, wrap them, and deliver them on the carousel along with their bags. The happiness the airline brings to these passengers and the element of surprise had me teary. You really have to see how well done this is! Also on More Time to Travel: What is it like to fly WestJet?